"What we really need is a pathway toward strength and success that doesn't require a near-death experience -- and a future in which fewer people rank prison as the best thing that ever happened to them." Daniel McGinn, "Do You Really Have to Fail to Succeed," Harvard Business Review, July-August 2014, 126-127. 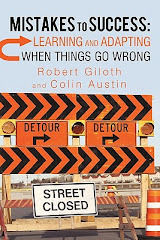 This critical review of several recent books on mistakes and failure argues that big failures do not have to always be a prominent part of our entrepreneurial resume or a requirement for our child's first grade diploma in grit. Yet, there is no denying effective learning is naturally about trial and error, do overs and resilience. Overblown rhetoric about "failing fast, "failing forward" and making only "new mistakes' suggests we know more about the mistakes and success process than we actually do. And most mistakes are, unfortunately, about the daily grind implementing what we already know.